How did ecommerce change in 2018? Let’s take a look at the data. Littledata benchmarks online retail performance in Google Analytics, and with over 12,000 sites categorised across 500 industry sectors we have a unique insight into ecommerce trends in 2018. The pattern we’re seeing is that web sessions are becoming ever shorter as users split their attention across many ads, sites and devices. Marketers need get visibility across a range of platforms, and accept that a customer purchase journey will involve an ever greater number of online touch points. In the following analysis, we look at how performance changed across 149 ecommerce sites in 2018, and how these trends might continue in 2019. 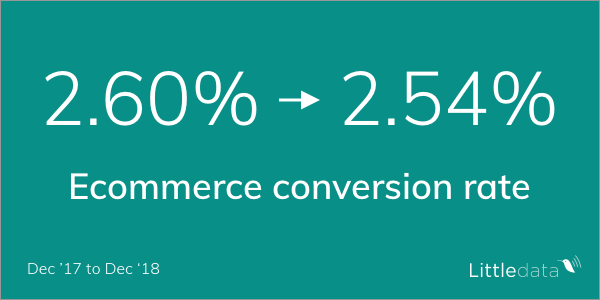 Ecommerce conversion rate has dropped by an average of 6 basis points, not because of a drop of online sales – but rather because the number of sessions for considering and browsing (i.e. not converting) has risen. This is partly an increase in low-quality sessions (e.g. SnapChat ads preloading pages without ever showing them to users), and partly an increase in users from platforms like Facebook (see below) which bring less engagement with landing pages. See our mission to Increase Ecommerce Conversion Rate for more details. Revenue per customer is the total sales divided by the total number of users which purchased online. 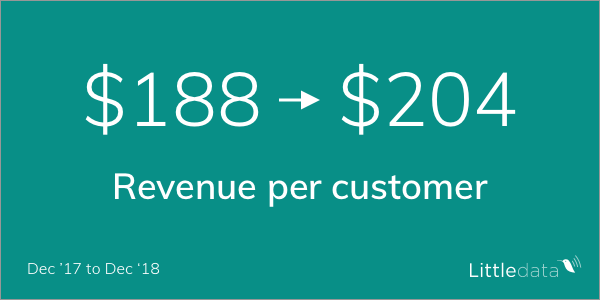 The increase of $16 USD per customer per month shows that many stores are doing better with segmentation – ignoring all those sessions which don’t convert, and retargeting and reselling to those that buy lots. The growth in subscription business models is also fuelling this trend. Getting a customer to commit to a regular payment plan is the most effective way of increasing revenue per user. See our mission to Increase Average Order Value for more details. Content marketing became mainstream in 2018, and no self-respecting brand would now rely on the homepage alone to drive interest in the brand. 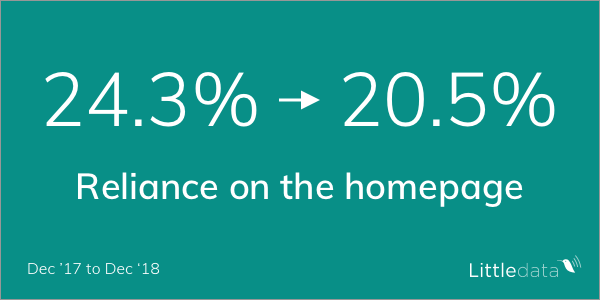 The percentage of traffic coming ‘through the front door’ will continue to fall. In building out a range of keyword-specific landing pages, stores are harnessing a wider range of Google search queries, and providing more engaging landing pages from Google Ad and Facebook Ad clicks. 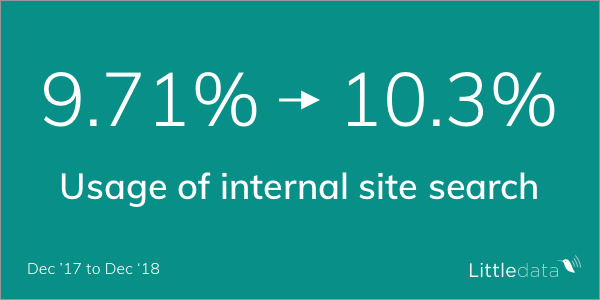 Along with fewer visitors coming through the homepage, we are seeing fewer browsers use traditional category navigation over internal search. We think this is partly to do with younger consumers preference for search, but also probably reflects the increasing sophistication and relevance of internal search tools used by ecommerce. Even after Facebook’s data security and privacy embarrassments in 2018, it continues to grow as the 2nd major global marketing platform. Although few sites in our benchmark rely on Facebook for more than 10% of their traffic, it is a significant driver of revenue. 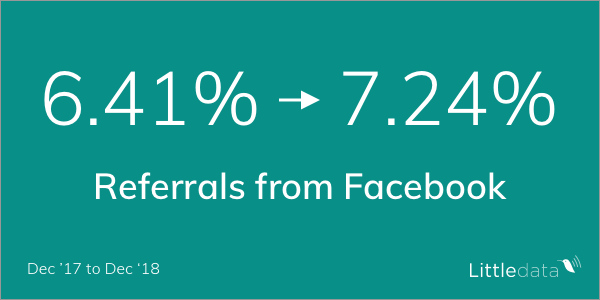 As merchants continue to come to Littledata to find out the real ROI on their Facebook Ads, check back next year for a new round of analysis! How did your site perform? 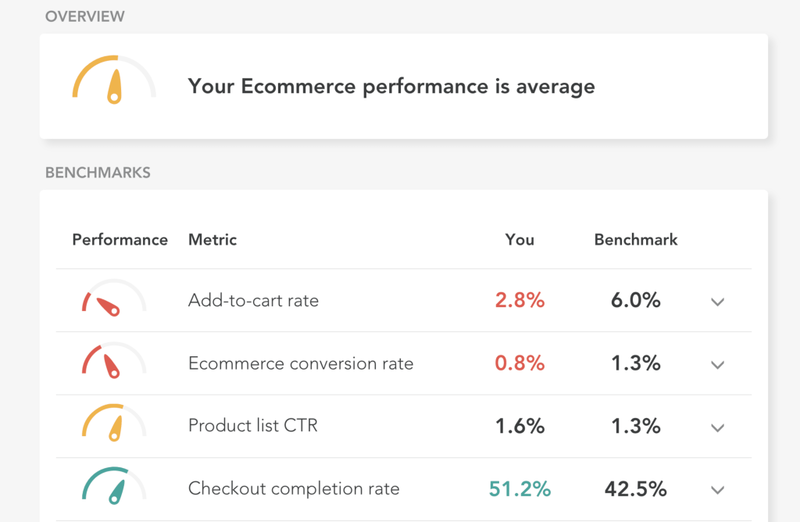 If you’re interested in benchmarking your ecommerce site, Littledata offers a free trial to connect with Google Analytics and audit your tracking. You can see ecommerce benchmarks directly in the app, including ‘ecommerce conversion rate’, ‘referrals from Facebook’ and ‘reliance on the homepage’, to know exactly how your site’s performing. Sign up today to benchmark your site and import Facebook Ads data directly into Google Analytics. For this article we looked at Littledata’s private, anonymized benchmark data set, selecting ecommerce sites that had a majority of their traffic from the US and more than 20,000 sessions per month. We measured the change from 1st December 2017 to 31st December 2017 to the same month in 2018.